Orient Express has renewed their sponsorship once again with the IDBL as the title sponsor of the historic 46th annual Orient Express Motorcycle U.S Nationals on September 11-13, 2015 at Atco Dragway in New Jersey. 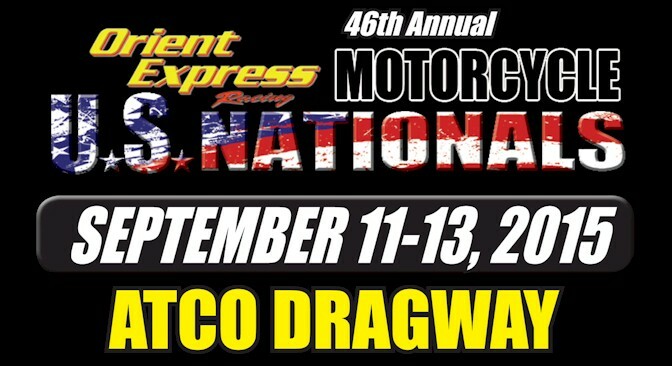 The Orient Express Motorcycle U.S Nationals at Atco has become a staple event in the IDBL Series, and has led to even more growth in the series as it attracts more racers from the North to the IDBL. Orient Express is also continuing their long time support of the Orient Express Pro Street class, and has been the class sponsor now for 7 consecutive years. New for 2015, the Orient Express Pro Street class will now be competing for $3,000 to Win ($500 increase this year), $1,000 to Runner-Up, $250 to Semis, $150 to 1/4 Finals (increased from last year), and $100 to 1/8 Finals. Entry Fee is now $200. Orient Express is also a sponsor of the famous $24,000 3rd annual Orient Express Pro Street Battle Royale that will take place at the DME Racing Fall Nationals at MDIR on October 2-4, 2015. The next event for the Mickey Thompson Tires IDBL Series will be the Pingel Spring Nationals at Maryland International Raceway on April 24-26, 2015. For more information on the Mickey Thompson Tires IDBL Series, visit www.RaceIDBL.com or connect with us on Facebook, Twitter and Instagram @RaceIDBL. See you at the Strip!